Storage demands seem to be never unending so we always have a large room for the extra storage options. While selecting the storage console items for your house you can choose large and big items like the dressers, cabinets and tables to that in future they can deal with your increased storage needs. 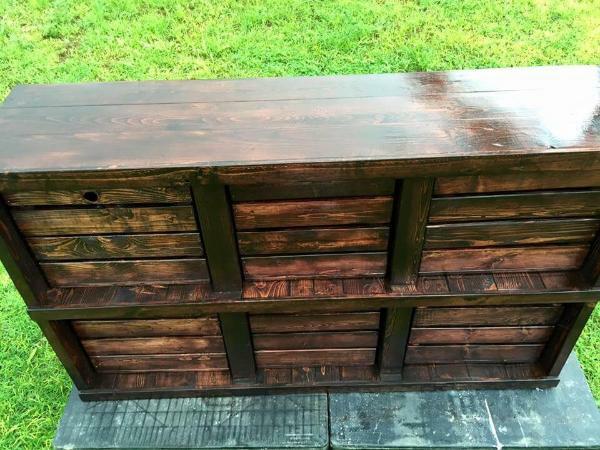 But the purchase of such furniture items from the market is always a rip offs that is why more and more people are getting attracted to the pallet furniture. And we feel proud to serve as one of the platform proving the pallet projects and ideas to the people all over the world. So today we are with a very functional and amazing storage solution for your kitchen, living or the bedroom having a larger capacity to hold a heap of the items in it. 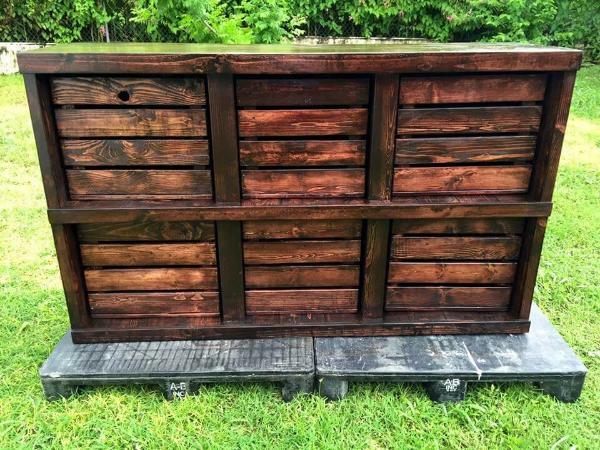 So check out this DIY pallet and crate made dresser with six storage crates or baskets to house a variety of the things in them like the clothes, ties, make up, jewelry, not pads etc and almost all the range of cooling accessories too depending where you use them. 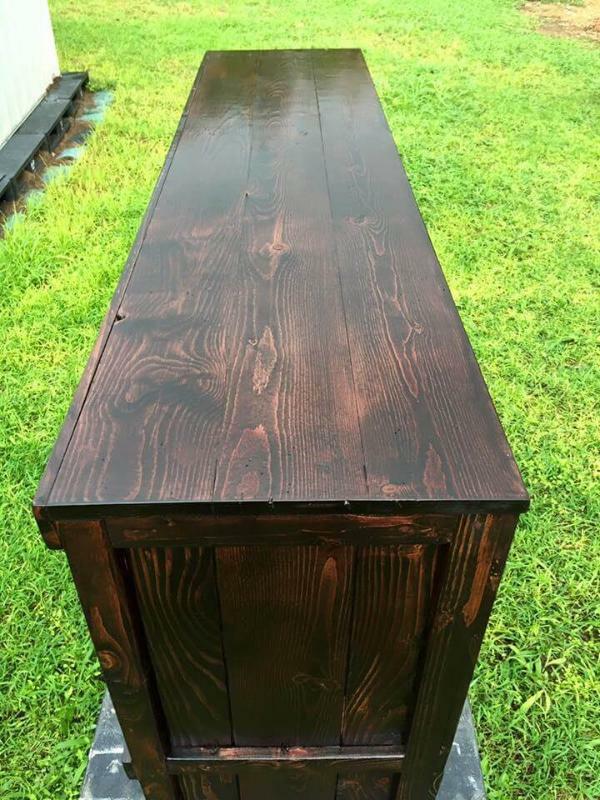 The dark chocolaty stain makes it look really tempting to juice up the decor of your interiors too. 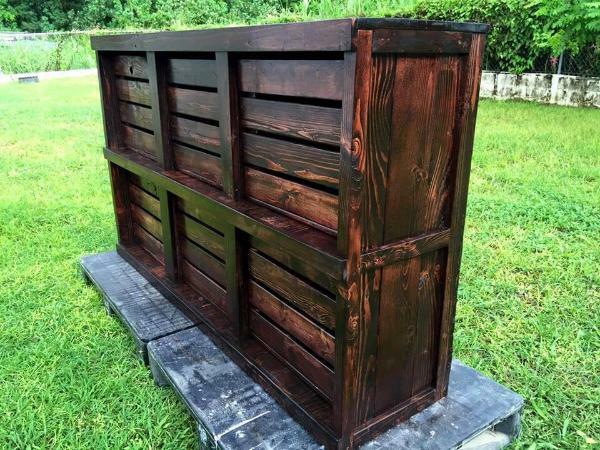 The dressers are the need of every home for they hold and organize loads of stuff on it and this pallet and crate made dresser is coming free to your house if you make some crafty efforts. 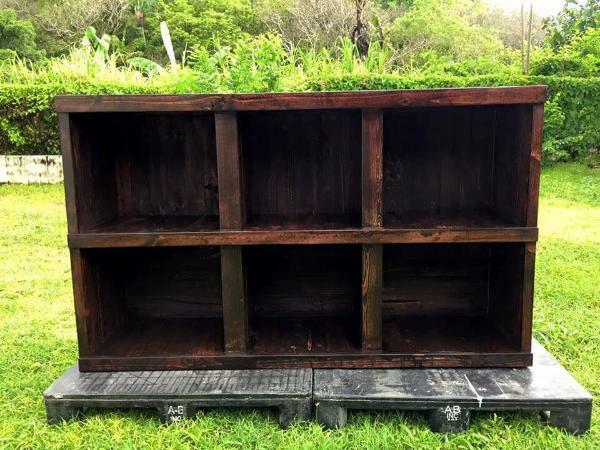 First of all the pallets have been cut into the slats and planks to install this basic structure of the dresser with six storage cabinets in which the crates would stuck in. 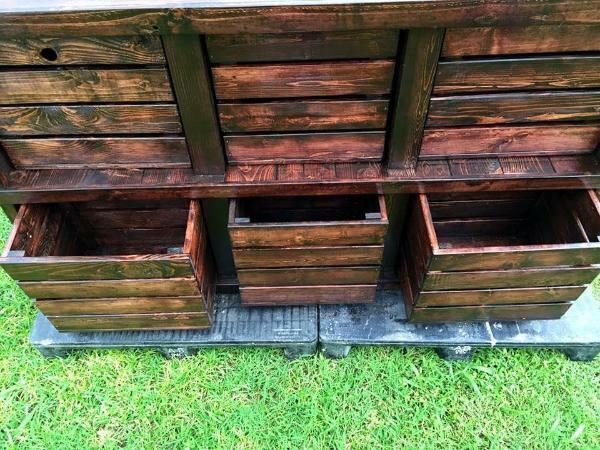 The crates can be made of the pallets or you can use the empty ones resting in your own home and or in your surroundings and then have been stuck in this dresser to be used as pull out drawers. This is what your dresser would loo after the tucked in crates as storage baskets or the drawers in which you can hold and hide a bunch of your knick knacks and utilities. 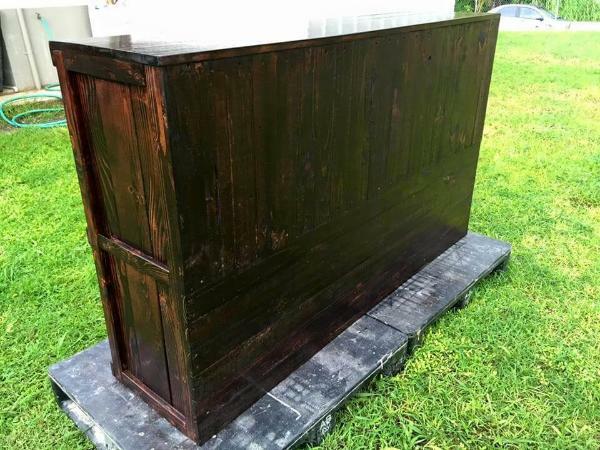 This is the side view of this dresser which shows how slim and sleek the dresser has been in its style, design and shape and pallet cut slats are forming the sides up. Here is the view of the wide and broad dresser top which also assures to hold loads of items on its self mostly the decorative ones if you are using it in your living, bedroom particularly. 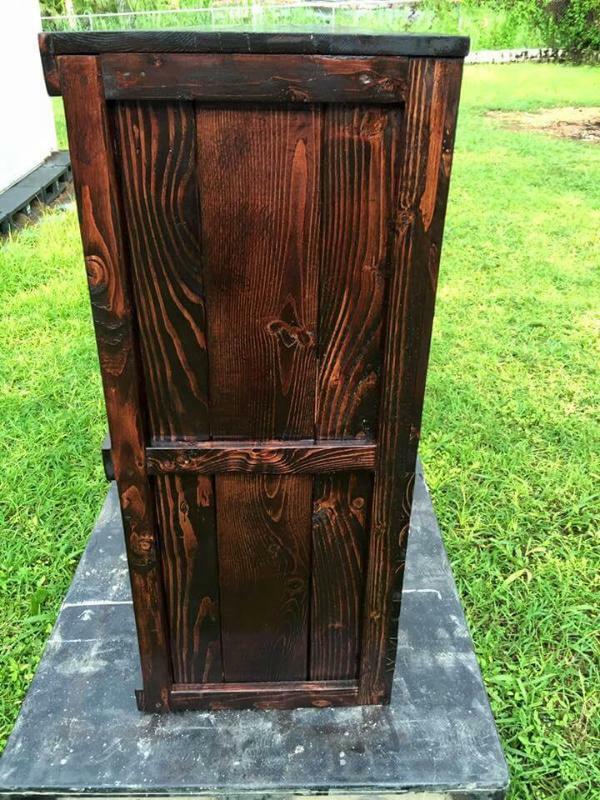 To give this dresser a nice rustic finish we have chosen the chocolaty brown hues to get it stained and look that fascinating and complimentary for your home decor. You can use it in your bedroom for the storage of your clothes and in kitchen it would act to hold and organize much of your cooking apparatus and accessories so make it work what you want.